Get awesome Quilter tone and useable power from a pedal-sized head. Quilter’s in-depth knowledge of tone and overdrive is now available in a compact pedal format with 33/45 watts of speaker power. Perfect for the player who doesn’t need the mighty Quilter Tone Block’s 200-watt output. Go ahead, plug in, turn it up and watch the jaws drop as a big helping of high energy Quilter mojo pours out of this little box! Clean or dirty, this efficient little workhorse keeps on rocking. Gain, Tri-Q, Master. The same three wide-range controls that made the Tone Block 200 famous are now available in pedal form. Gain goes from clean to soaring overdrive. Tri-Q goes from Blackface chime to roaring lead boost. And Master takes you from full output down to zero with no change in tone or overdrive. It's perfect for practice or playing out. 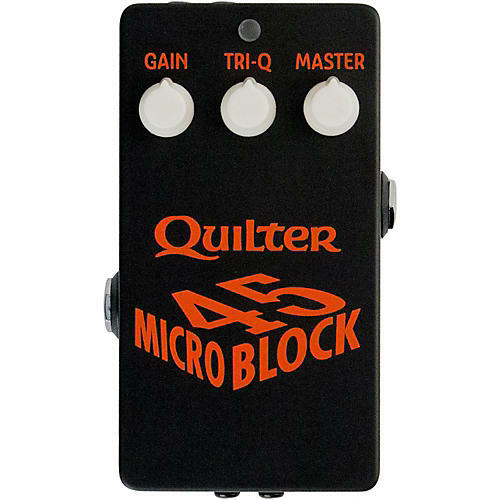 As a complete miniature guitar amp, the Quilter MicroBlock 45 can fill a bedroom, living room, or even a small club as a backup amp. In addition, the MicroBlock makes a great utility amp for driving headphones, and a great general purpose playback amp using either the guitar or mini-jack input. It can even be used as a natural distortion pedal by using the headphone jack as a line output. It’s the easiest way to see what the “Quilter thing” is all about.